OK. Now I can say that this kite loves to spin fast. Likes Back-Spins, 340s, 540, Taz-Machines, and Crazy copters. It also can do fades, half axles, cascades, J.Ls and insanes too. 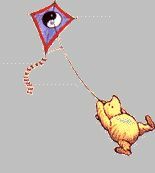 Its a fast kite so you have to treat the kite with gentle tugs to slow it down. The Kite has a 3 point standard bridle. The kite is flying with the standard tail weight setup and I lowered the tow points of the bridle about 1/2 inch to make the kite more responsive. This is my second video. Planning to make more videos with it in a near future. The sail is rip-stop nylon and the frame is made with 6 mm Carbon-fiber. Don't get me wrong, I love my kite I think is a great purchase. Best off all it can do a great selection of tricks that more expensive kites do. My guess is That SkyDog Has a great flying kite and decided to make it affordable for us. I Also Have a Duende (a $250 kite) It can do all the tricks too and its made with Icarex pc31, Wrapped carbon fiber frame. The only trick I haven't been able to do with the Jammin that the Duende can do is the Yo-Fade. About the fade I'll give it a 6 in a scale from 1 to 10. The best fade kite I have is a French connection II UL. I have been able to do a rising fade all the way up to about 30-40 feet. Do you have any videos of pictures of your kites? Thanks for these great posts,kind sir! Like the 2.3 better than the 2.5 but I added more tail weight to make it fly the way I like it. Out of curiosity, how do you find the SF Pro compares to the Soul Norm? Please compare with the Duende too against the SF Pro and the Soul.